The 6 Artists were chosen through a process that included an open call for applications sent out through social media, this website, other community forums, as well as direct inquiries from the Artistic Producer. Each RHS Artist each received a commission to create a new work, or substantially re-envision or redevelop a recent work. 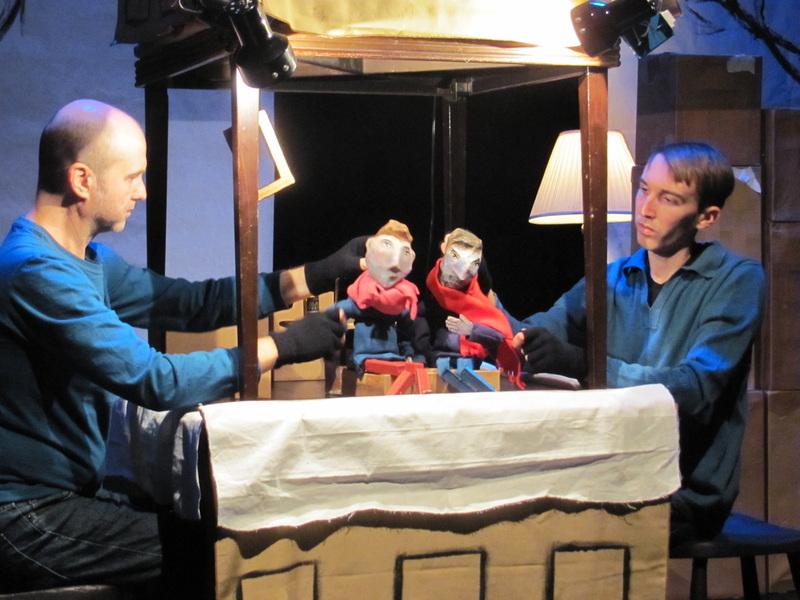 The Artists receives technical support, including tech rehearsal time, stage hand assistance, and lighting design by well-regarded local designer Mike Grogan, also Tech Director for the Showcase, and promotional support. RHS recognizes that mid-career artists of quality, with ample experience creating their own work and developing their own vision, are best served by staying out of their creative process, and allowing them to do what they always do and what they have proven themselves to be so good at. RHS believes that the best support artists can receive is freedom and resources to do their work. 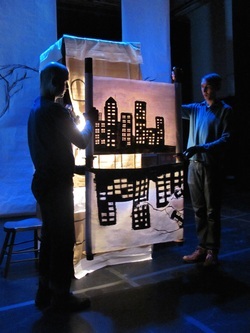 Inspired by singer-songwriter Dar William’s song of the same title, Mortal City uses music and visual imagery to puppeteer a poem of a city. Set during an ice storm at night, Mortal City explores creating and finding the warm pulse of this city in its layered soundscape, fragile infrastructure, simple light, and periwinkle winter skies. Performed by Bart Buch and Seth Eberle. Constructing imagery by blending dance and theater with provocative visual installations, Deborah Jinza Thayer mixes movement with metaphor to trigger new modes of perception. Her hope is to inspire awareness of, and reflections on, how we interpret and express being in the world. She calls her choreographic work, "Movement Architecture." Diana Takes a Swim is a dive into the female collective unconscious. The evening begins with Thayer's solo which was initially inspired by her mother's kimono as a way to explore the invisible aspects of her Japanese heritage. However, Diana developed into a more universal exploration of women's relationship to power. In this collaboration with composer Janika Vandervelde, the piece utilizes a 25-ft dress which was inspired by fabric-draping, used by painters and photographers in framing the female form. Traditionally, the artist, typically male, chose what needed to be seen and/or hidden. In this scenario, Diana controls her own draping mechanism and explores this dynamic. The dancers are all costumed in similar 25-ft red dresses. Combining the shapeshifting capacity of the dresses, elements of nature, and archetypal characters, Diana further delves into the female aspects of beingness. Now, who has the power of the gaze? The model? The observer? And as she watches the observer(s) watching her, does this power shift? “Fu-Ku-Shi-Ma” is inspired by the earthquake and tsunami in Tohoku region of Japan on March 11th, 2011. The earthquake shook the buildings and tsunami tore the cities apart. Standing before the power of nature, we witnessed that we were so small and powerless. Gadu, a Subbody Butoh practitioner and a Japanese native, dedicates this performance to the power of nature and the spirits of those who lost their lives that day. This performance contains naked bodies. Imagine yourself as a ripple on a calm lake. Then, imagine other people around you as other ripples. See the resonance between your ripple and other ripples. Visualize everything around you (houses, furniture, pets, plants, earth, stars, galaxies, etc) as ripple and feel the resonance between you and everything else. Then take "you" and "others" out of all this. Nothing but Resonance. Buddhist call this state "Emptiness. "By practicing Resonance Art, we can cultivate our heart to stay in this state in every moment of our life. "not until the fat lady sings"
As a multidisciplinary artist, my work is unified by a strong focus on the body: body as artistic subject, as object, as medium, and as imaginative force. I create from the body as a potent form of “active imagination,” seeking to unleash images and energies deep in the psyche that have the power to speak universally. I want to make theater that is mythic in this sense: theater that probes archetypes (ancient and current) to release the vital energies contained in them. I am looking deeply into story to find creative images of the self that help us understand our own growth, and our place in community. I am passionately curious about the relationship between body, soul and community - Jungian modes of knowing the self and of placing the self within culture. I am exploring how dream images and mythical archetypes reveal and integrate parts of the self. I am interested in story: what is true, digging through layers to find the truth, exploring deconstruction, associative image and fantasy as a means of interacting creatively with personal narrative. Trapped in a giant fat suit, tethered to life support in the ICU and waiting for a miracle, our Lady of Fat struggles to make her escape from the circus of her life. Will her daughter find her before the Fat Lady makes her final exit? 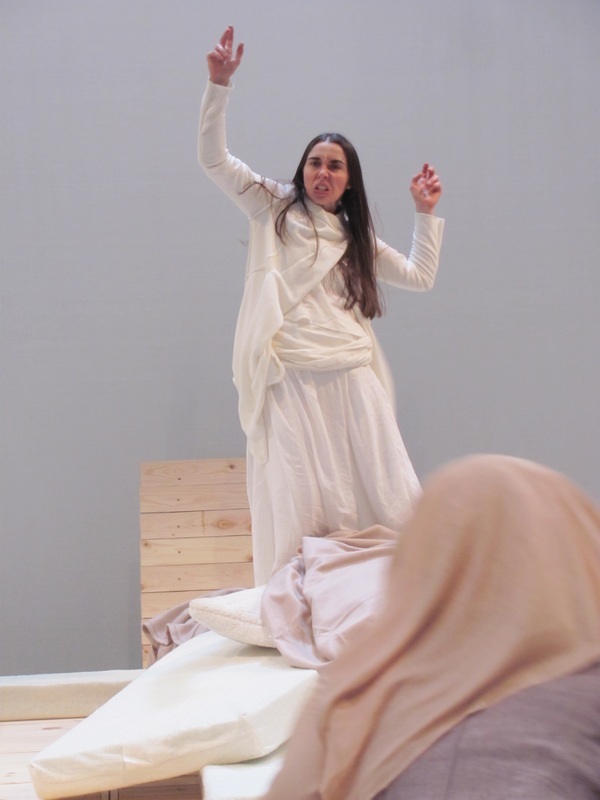 “Not until the Fat Lady Sings” combines movement, text, puppetry, and music to tell the story of a mother and daughter reaching through the layers of the body and its stories to touch what is true in the other. Bound to each other in a dance of conflicting needs for connection and protection, they journey from hospital room to circus to revival meetings. What is the miracle that will save them both? Kym Longhi navigates the territory of memory, grief and personal mythology to probe the relationships of mother and daughter, flesh and spirit, the body and love, and the miraculous and the mundane. Skin(s) examines what we perceive, hold and reveal through our skin. A new duet by contemporary choreographer Rosy Simas. Simas work investigates identity, homeland, history, culture, and relationships through movement. Performers: Debby Katajama and Jose Navarette (NAKA Dance) from Oakland, CA. Simas values involvement in community as essential to living and art making. She is not only a choreographer but has held administrative and management positions in the arts and non-profits. Since 1992 she has been committed to creating opportunities for other dance makers and artists to present their work. "The Master" - a piece that manifests itself out of thin air" is a sister-piece to Voskuil’s latest epic dance-and-theater work “The Student”, which premiered earlier this year at the O'Shaughnessey in Saint Paul. that is of our own making. Culminating into a theater fantasy, “The Master” is about manifested drama on a personal and theatrical level.